Here’s how to move you Excellerate from one computer to the other. Navigate to that location on your computer using your File Explorer. In the example, I am navigating to C:\excellerate. After the last ‘\’ will be the actual database file you are looking for. 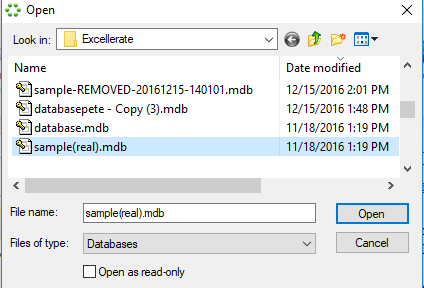 In the example, the database name is sample(real).mdb – Right click that file and choose Copy. Next, plug in a USB drive or some sort of external storage. Open that drive in File Explorer. Right click on the drive and choose Paste. This will copy the database to the external drive. You can then unplug the drive from this machine. Install Excellerate on the NEW computer. Plug in the external drive into the NEW computer. Open the external drive in File Explorer and locate the database file. Right click the file and choose Copy. In File Explorer, navigate to the C:\Excellerate folder. Right click on some white space in that folder and chose Paste. You will now see a window asking you to select a file. Make sure you are looking in C:\Excellerate which is where you stored the database, and select the database you saved in that folder and click open. 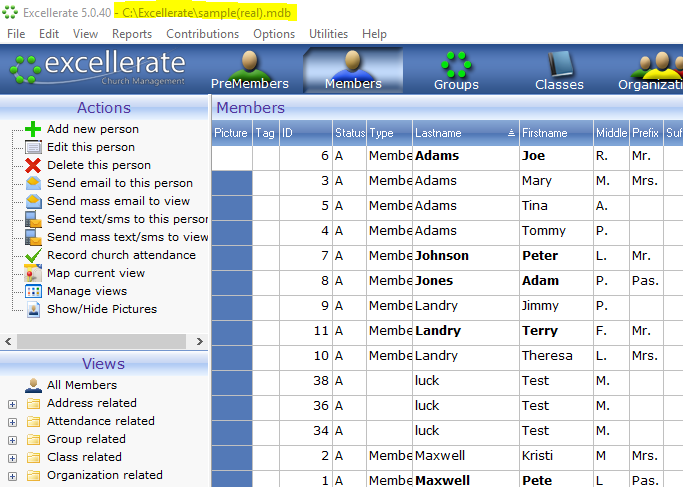 You will now be prompted to enter a userID and password to login to Excellerate. This will be the same as what you used to log in on the old computer. Enter the Id and password then click login. You will be prompted to make this your default database and you will want to click yes. 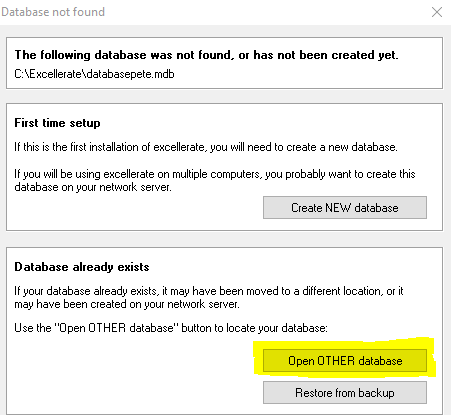 You have successfully moved your database from one computer to the other. This means you will no longer want to make changes to any data on that old computer.